Las Vegas is known for a lot of things. It's located in the first state (Nevada) to legalize casino gambling, it's home to the largest hotel in the world, and it's considered the wedding capital of the world. Now Sin City has one more "first," the largest single installation of Panasonic 103-inch, high-definition plasma displays in Sam's Town Hotel and Gambling Hall. Sam's Town is a 29-year-old property that has undergone eight major renovations in its history. Boyd Gaming, the parent company of Sam's Town, thought it was once again time to make some improvements. This time, they focused on the race and sportsbook. The last time the "book" had been updated was in the early '90s. Instead of slapping on a fresh coat of paint to the existing space, they decided to build one from scratch. According to Mike Garms, vice president and general manager of Sam's Town Las Vegas, the project was a $15 million investment designed to help keep the property fresh and exciting, and to keep the race and sports fans coming back. "It is a tremendous amenity to the customers here at Sam's Town," he says. "And one that many of the customers in the local market find very attractive when they are deciding where to go for their gaming entertainment." YWS architects of Las Vegas, NV were hired to do the 14,000-square-foot design, and Las Vegas, NV-based JBA Consulting Engineers would handle the extensive audiovisual design. Joe Gombos, an audio/video designer with JBA, worked closely with the management of Sam's Town during the design phase. In addition to the owners input, finding out what the customers want is key in creating an inviting environment. "We asked customers what it is they would like to see if a new race and sportsbook were being built today," says Gombos. 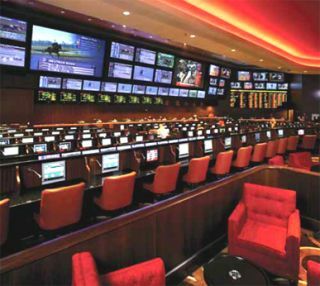 "On the audio/video design side of things, patrons of the race and sportsbook wanted big impact, large screens, but not just one or two of them. They wanted to see a great number of large screens as well." The design included over 200 displays. The largest images were provided by two 12,000 ANSI lumen Christie Digital Roadster HD12K DLP rear screen projectors, on 18- by 10-foot dual Mylar mirror screens from Stewart Filmscreen. Surrounding the Roadsters are the 15 103-inch Panasonic TH- 103PF9UK high-definition plasma displays. According to Gombos, this is the largest single installation of these gigantic monitors in one location in the world. He chose to go with plasma displays over LCD for some good reasons. "Plasma was the only flat panel technology available in that size at the time. Plasma has great contrast and brightness, but the ambient lighting is typically subdued in a race and sportsbook, so brightness was not a major concern. Controlling contrast ratio was much more important," he adds. One concern about plasma has been image retention problems, or so-called "burn-in." Gombos considered this issue very seriously. "Plasma technology has come pretty far in that regard. They use phosphors that have much higher resistance to burn-in today. As long as you have fast motion, burn-in is not going to be that much of an issue," he says. "And because horse racing and sports are typically fast action, you are not going to have that issue as much as you would if you were displaying static images." The final design included 150 Magnavox LCD TVs in the individual racing carols, 14 LG LCD monitors in the sportsbook bar, 12 65- inch Panasonic plasma displays, 11 Magnavox units in the VIP seating area, and nine 70-inch LG plasmas. Trans-Lux LED boards display the current odds for the sportsbook customers. R2W Inc., and his crew to develop new installation techniques to overcome challenges they had never faced before. "When you have a large install of 103-inch plasmas sitting on a wall that is angled at 12 degrees, and it's never been done before, you really design everything you do from scratch," says McConnico. One thing they designed was a custom mounting bracket, since the one supplied with the units didn't really work in this environment. "We fabricated a custom one-piece mount for the plasma. This gave us the ability to install the mount directly to the structural steel, before they put up the sheet rock," says McConnico. Mounting directly to the structural steel was extremely important, since each plasma and mount weighs about 600 pounds. When installed, the 15 plasmas weighed over 4 tons. "Attaching the plasma mounts first also allowed us to lay out the entire wall perfectly and make sure we had perfect symmetry before we hung the displays," adds McConnico. Once the mounts were up, the next challenge was attaching the displays 30 feet in the air on a wall angling in towards the room at 12 degrees. "We created a custom lifting assembly that adapted to a forklift, like a claw or hook that connected directly to the display's eye bolts," notes McConnico. "This custom assembly saved them time and enabled them to get the displays in place with little trouble." Once the displays were hung, dealing with the number of sources to feed the monitors was next up. The sources included 25 horse racing receivers, 12 DirectTV DBS units, eight COX cable TV receivers, and five CBan television receive-only satellite units. The horse racing feeds come in as an NTSC analog signal and are scaled through an Extron DBS 304 to 1080 x 1920. The Direct TV and cable TV outputs are digital and set to the same size. All signals are amplified using Blonder Tongue equipment and modulated with Cabletronix. From the DBS 304, the signal goes to a 64 x 144 AutoPatch Matrix switcher. From there the component signal goes directly to the displays. The management at Sam's Town can send any source to any display using two AMX NXT-1700VG Modero touchpanels or one Modero NXD-1500VG wall-mount unit. The new book opened to the public Wednesday, October 17, 2007. "The project has had a very noticeable, immediate impact, and the increase has been very positive, certainly justifying the capital expended on updating this property amenity," says Garms. George Klippel is the manager of classroom technology and distributed education at Carnegie Mellon University's Information Networking Institute. He can be reached atgklippel@cmu.edu.